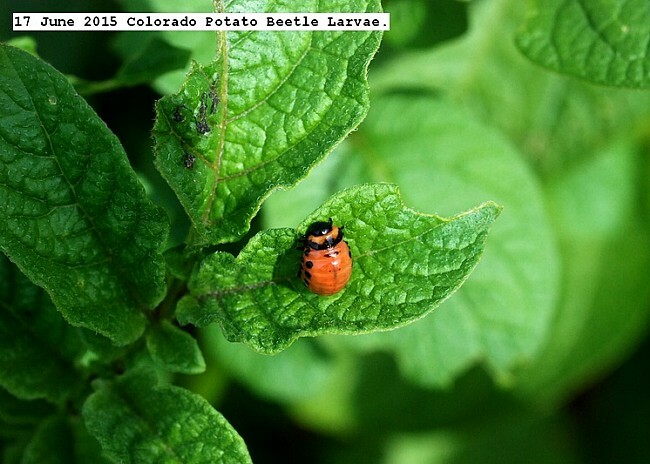 http://www.durgan.org/2015/June%202015/17%20June%202015%20Colorado%20Potato%20Beetle/HTML/ The Colorado Potato Beetle has surfaced on my potatoes. These are pictures of the hatched eggs, no adults have been seen to date. Due to my small number of plants they are hand picked as necessary for control. They cannot be ignored since complete destruction of the foliage will result is allowed to mature. http://www.extension.umn.edu/garden/insects/find/colorado-potato-beetles/ Colorado potato beetles in home gardens. This is a complete detail of this pest. http://www.durgan.org/URL/?SIGKH 22 June 2013 Colorado Potato Beetle. This is the 2013 infestation. This entry was posted in Uncategorized and tagged Colorado Potato Beetle. Bookmark the permalink.